The Solid State Chemistry Group has a Student Bursary Scheme to provide financial support to postgraduate students to attend important solid state chemistry conferences in the UK or abroad. The Student Bursary Scheme is open to all postgraduate students who are members of the RSC's Solid State Chemistry Group and are undertaking research in solid-state chemistry. In return for the bursary, the beneficiary must produce a short written report for the Solid State Chemistry Group Newsletter! The Solid State Chemistry Group committee have donated their IYC Challenge Grant to the Perovskite Project. 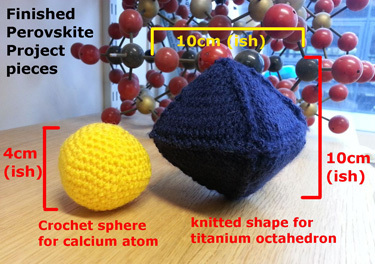 The project aims to bring solid state chemistry and craft together to generate a giant knitted and crochet model of the common mineral Perovskite. The project is designed to bring together scientists with non-scientists and facilitate sharing of experience and knowledge to create a permanent model. The project is being run from the University Of Surrey Chemistry Department by Dr Julia Percival. The model itself will be made of knitted and crochet pieces in certain colours depicting different parts of the perovskite structure. Participants will send their pieces in over time since the launch in December 2012 and the final model will be assembled in September 2013. The patterns have been generated and tested and the project is currently in the advertising and collecting finished pieces stage. The patterns for the pieces are attached at the end of this report. Figure 1 shows the ideal dimensions and design of the pieces for the model. Contact has been made with the National Federation of Womens' Institutes and the project details will be available on their own virtual learning environment. I have also been in contact with both their handicraft and science divisions about promoting the project. A booklet on the project with patterns and background information will be distributed to all delegates at an upcoming NFWI science representative conference in May. Many local craft groups have been contacted about the project through the UK Hand Knitting Association and again positive feedback has been received. The project was showcased at the Cheltenham Science Festival via run knitting and crochet workshops. The RSC Yarn Club (a staff club based in Thomas Graham House) are also taking part. The final construction phase will be carried out at Surrey and local participants will be invited to attend, as will RSC representatives and local press. It is anticipated that model will be constructed from an outer frame, possibly made of wood or light metal and the pieces will be suspended using either wire or fishing line depending on the size of the final model. There will also be a “wall of fame” where participants can have their contribution recorded which will be designed and framed and will travel with the model if it is used by other institutions which is it hoped that it will. When it is not being used it is hoped the model will go on display at the University of Surrey.